Brand new home in Elk Creek Meadows. Located in Bailey from Highway 285 just 7 miles up County Road 43A lies homes for sale in Elk Creek Highlands for a weekend getaway or a peaceful place to call home. Enjoy endless views of Mount Rosalie, Mount Evans, blue skies and radiant sunsets from the redwood decks. Affordable living offered in the mountains with raised ranch, 2-story, ranch homes and cabins from 1,000-6,000 square feet floor plans. Most homes in Elk Creek Highlands sit on 1+ acres with a few larger properties. Several homes were built in the 1990’s and early 2000’s showcasing towering pines, aspen groves and evergreens. Wildlife sightings are abundant and the average elevation range is 8,700-9,100 feet. Adjacent to Pike National Forest there are miles of hiking and equestrian trails, mountain biking and camping, a wildlife lover’s dream. Additional parks in the area are Charmetella Park and Staunton State Park for outdoor activities. The homes in Elk Creek highlandshave an average of 2 car garages, many with additional recreational vehicle parking, outbuildings, sheds and workshops. Elk Creek Highlands HOA is voluntary and offers a community clubhouse for neighborhood events, corral, stables and a stocked pond for fishing. Shopping, dining in nearby Bailey and Conifer offers Conifer Town Center and Conifer Marketplace. Golfing in the area is can be found at Red Rocks Country Club, Evergreen Golf Course and Hiwan Golf Club. Easy access to Highway 285 for travel to Conifer, Morrison, Evergreen and the Denver Tech Center is only about an hour away. See what your home is worth With an Instant Home Valuation Online. Want advice on selling your house? We provide a free staging consultation, pre-listing prep plan, and a Elk Creek Highlands real estate market analysis. Call us at 303-325-5690 to learn more. New to the Area? 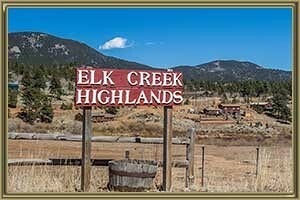 Call our Elk Creek Highlands real estate agent at 303-325-5690 to schedule your tour of Homes in Bailey CO.